Example of a westward-moving cloudiness transition in the southeast Atlantic off the coast of Africa. (left) regional view and (right)showing detail of the sharp edge of the transition boundary. Satellite data courtesy of NASA Worldview. Visible Satellite Movie from 20140526. Meteosat satellite data from EUMETSAT. IR Satellite Movie from 20140523 to 20140527. Satellite data from NASA GES DISC. 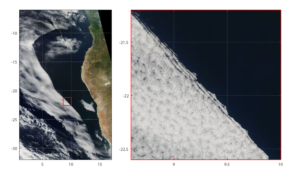 Movie S1: Movie of 15-minute Meteosat visible imagery for 26 May 2014 from05:00 to 18:15 UTC showing (left) regional view off the southwest coast of Africa and (right) close-up view corresponding to the yellow box on the left. Movie S2: Movie of 30-minute merged infrared 12 μm brightness temperatures for the period from 25 May 2014 00:00 UTC to 27 May 2014 23:30 UTC showing a regional view of southern Africa and the southeast Atlantic. Red denotes missing data. Movie S3: Movie of 15-minute Meteosat visible imagery for 26 May 2012 from05:00 to 17:15 UTC showing (left) regional view off the southwest coast of Africa and (right) close-up view corresponding to the yellow box on the left. Movie S4: Movie of 30-minute merged infrared 12 μm brightness temperatures for the period from 25 May 2012 00:00 UTC to 27 May 2012 23:30 UTC showing a regional view of southern Africa and the southeast Atlantic. Red denotes missing data. Movie S5: Movie of 15-minute Meteosat visible imagery for 12 May 2015 from05:00 to 17:45 UTC showing (left) regional view off the southwest coast of Africa and (right) close-up view corresponding to the yellow box on the left. Movie S6: Movie of 30-minute merged infrared 12 μm brightness temperatures for the period from 11 May 2015 00:00 UTC to 13 May 2015 23:30 UTC showing regional view of southern Africa and the southeast Atlantic. Red denotes missing data.